If your MacBook Pro has this “stage light” effect it’s probably about to fail. iFixit produces tools and guides for repairing MacBooks, iPhones, iPads and other Apple products. Its expertise in this area is widely acknowledged. The thinness of the ribbon cables is only part of the problem. 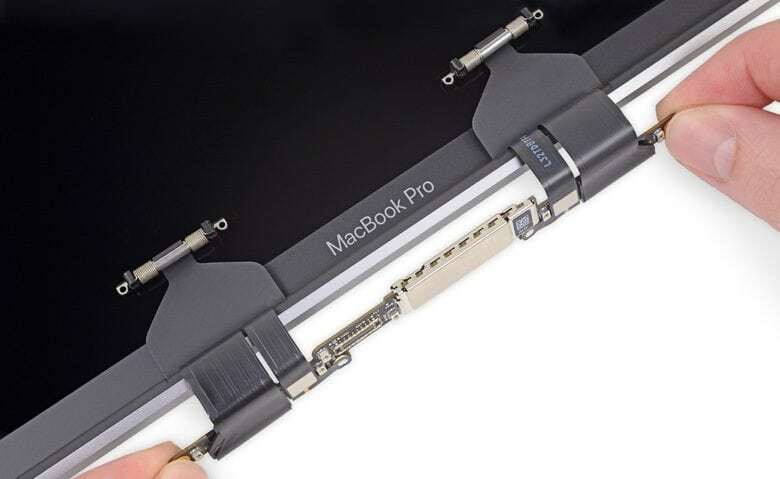 In fact, the thin ribbon cables are actually part of the MacBook’s screen. When they wear out, the only way to fix the problem is to replace the entire display, “effectively turning a $6 problem into a $600 disaster,” according to Dixon. And this potential problem might extend beyond the MacBook Pro. The display in the MacBook Air released last fall uses the same basic design. This model is so new the ribbon cables haven’t had a chance to begin wearing out. However, iFixit warns that the same problem likely will happen eventually. A petition on Change.org by Louis Rossmann asks Apple “to launch an extended warranty program addressed to this issue as soon as possible.” At present there are about 3,155 signatures.